Over 80 Cottingley Hall estate residents turned out in force on Saturday to celebrate Apple Day, the first community event in their orchards, which they planted in February 2016. The Lord Mayor of Leeds, Councillor Gerry Harper, officially opened the Apple Day celebrations and joined in the festivities. The fun traditional Apple Day activities included games for adults and children including apple bobbing, the longest peel competition, and biting apples on a string. People were able to make toffee apples and try their hand at making fresh apple juice. Feet were put to good use on two bicycle driven blenders which were peddled to create fruit smoothies. For the less energetic, apple produce was available from the jam and chutney stall. Neil Whiting of Cottingley in Bloom said: “Our Apple day celebrations were exceptional with over 80 people turning up on the day. They were most impressed by the apple pressing. “It’s great to see people enjoying the orchards. They’ve created a lot of interest since we planted them. We’ve got quite a few volunteers checking on the trees to make sure they’re alright and help pick the apples, which all need to be removed in their first year. 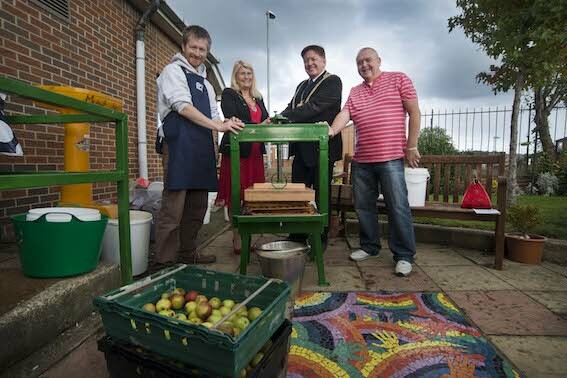 The Lord Mayor of Leeds, Councillor Gerry Harper, said: “It was a real privilege to open Apple Day in Cottingley and see so many local people come together in the orchard to have fun and take part in all the fantastic activities on offer. Cottingley resident, Emma Belt-Brown said: “I think the orchard is amazing for the whole community. The people of Cottingley are really going to benefit from having an orchard on the estate.